An Americana Richard Thompson for the younger generation? If I was just aimlessly flicking through the Americana section of a record shop and stumbled on FACTORY SECOND I think I would pick it up; which is surely the purpose of good cover art? The picture of the young Getz in front of a Jeep holding a rifle and a dead bird is certainly eye catching and inside the cover you get a lyric booklet that includes more childhood photos and doodles; already I’m hooked. Which finally brings us to the music of course; and much like the cover it is quality Folk-Americana of the highest order. 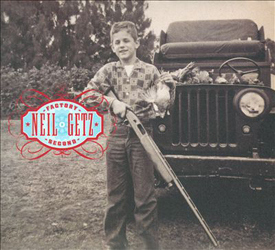 From Berkeley California; Neil Getz is a story teller par-excellence and each song tells a tale from beginning to end; some humorous, some pithy and all interesting and listenable to say the least. He also has the knack of writing a good melody and bringing his characters to life, which is a rarity these days. Opening tracks Bad Case of Passion and Factory Second both sound like Richard Thompson circa Rumour & Sigh, withFactory Second using the purchase of a dodgy guitar as a metaphor for his life and subsequent loves (RT would be proud to write the same song). Not in Love; Just Falling is an exquisite country-folk shuffle about the happiest time in a mans’ life – just before the hard work begins! Counting Trains which features cello, bodhran and concertina harks alongside some delicate acoustic guitar playing harks back to Richard Thompson territory for a dark tale of a young boy daydreaming about leaving home. Flock of Demons is another grief tinged tale with a banjo and bottle neck guitar sound that cuts through the words like a knife through butter. Neil Getz is a spectacularly good songwriter and uses words like talons to draw you in and keep you dangling until he’s finished with you; then just when you think you are safe he attacks again and you are at his mercy….for life. I apologise for the references to Richard Thompson, but as an ND reader, when you hear FACTORY SECOND you will grant yourself a rye smile; but Neil Getz’s target market will probably never have heard of RT and weren’t even born when he was at his commercial best; so the marketplace is wide open for this incredibly talented young man.